ISRO (Indian Space Research Organisation) and their commercial wing, Antrix, have stated they are willing to outsource manufacturing of Polar Satellite Launch Vehicle (PSLV) and the Small Satellite Launch Vehicle (SSLV) in order for the space agency to focus on their proposed human space program. The ISRO held discussions a week ago with a consortium of industries regarding PSLV industrialization with the objective of easing ISRO to focus on human space program and research and development activities. The PSLV was supposed to be produced by the industry. 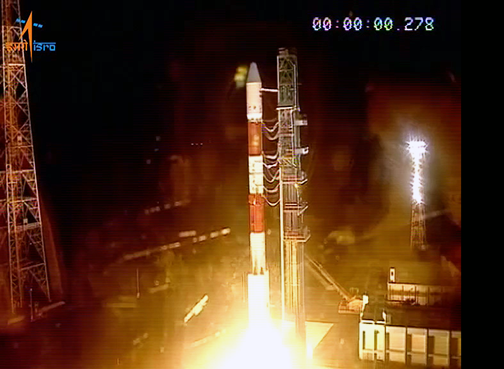 Screenshot from the video of the PSLV-C41 liftoff. Image is courtesy of ISRO. Sivan was addressing a press conference to announce the Bengaluru Space Expo (BSX), a three-day event starting from September 6 at the Bengaluru International Exhibition Centre (BIEC). BSX-2018 will have 100 exhibitors, 56 speakers and 600 official delegates participating. There will be a separate pavilion for human space program or Gaganyaan, which was announced by Prime Minister Narendra Modi in his independence day address this year. Modi had said an Indian astronaut would be sent to space by 2022. India will be the fourth country after the USA, Russia and China to send humans to space. Sivan said informal discussions had been initiated with the Indian Air Force on the selection of the crew. Once selected, it would take two-three years to train them. He also said ISRO would need to take the help of a foreign country for advanced training of the crew. SRO Chairman K. Sivan said that, definitely, in his opinion, in the ISRO activity the industry is going to play a major role. If only the industry is taking the load, ISRO can work out on human space programm and R&D activities, adding that the industry should help in manufacturing PSLV as well as SSLV. Sivan noted that the agency has not yet decided which country will be selected for training. Russia, Germany and USA have the facilities. Regarding the PSLV outsourcing, the ISRO chief said industry partners Hindustan Aeronautics Limited (HAL), Larsen and Tubro Godrej were among those who took part in the discussions. Sivan said the industry would have a huge role to play in Gaganyaan and in building facilities for mission control centre and launch pad and that Antrix was discussing this possibility with various industry players. He noted that it is possible to produce the PSLV from this consortium and the ISRO is already working on that project. Antrix Managing Director Rakesh Sasibhushan said that the small satellite service was an $18 billion market and they were looking at 50 to 60 launch vehicles per year, adding that such a launch schedule would definitely make it commercially viable to proceed. The general capacity Antrix is building is ooking at a revenue of around Rs 1,500 crore to Rs 2,000 crore per year.